The latest edition of the Michelin Guide in the UK has awarded two stars each to Japanese restaurants, Araki and Umu, in London. The gains for the two Japanese restaurants were two of the most eye catching elements of the UK Michelin Guide 2016, which also further expanded its list of recommendations beyond London. ‘It is a great compliment to London that when Sushi Master Mitsuhiro Araki closed his three-star counter restaurant in Tokyo it was because he wanted to come to the UK to challenge himself in a different culture,’ said Michelin guide editor Rebecca Burr. This year’s guide also continues from last year in celebrating more restaurants outside of the capital, with 11 of the 15 new one-star establishments outside of London. Leeds received a Michelin star, for The Man Behind the Curtain from chef Michael O’Hare, who recently won the North-East regional heat on the BBC One programme, Great British Menu. ‘The next generation of chefs are really coming through to give the established chefs a run for their money. They all have their own individual style and their ability… looks set to lead them on to great things,’ said Burr. 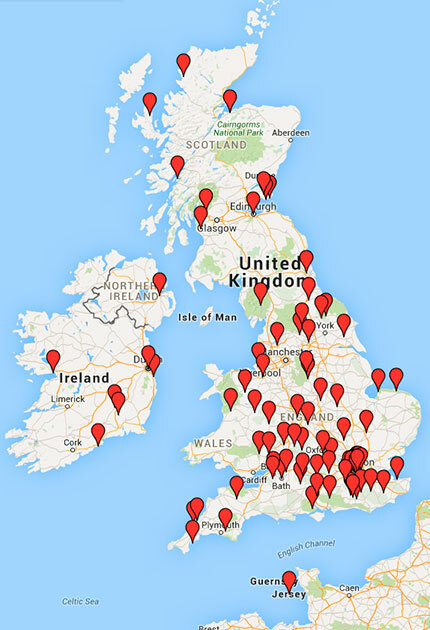 The locations of UK restaurants with one Michelin star. Newcastle upon Tyne received a star for House of Tides, as did Birmingham for Carters of Moseley. Whilst Wales did not receive any new stars, five restaurants across Scotland, Northern Ireland and the Republic of Ireland were awarded one star each. The new one-star restaurants in London are Lyle’s in Shoreditch, Bonhams in Mayfair, Portland in Marlyebone and Dining Room at the Goring. This year, three-star restaurant The Fat Duck from Heston Blumenthal will be absent from the guide, after it’s temporary move to Australia, which meant it has not reopened in time to be assessed. The other UK three-star restaurants – Alain Ducasse at the Dorchester, Gordon Ramsay and the Waterside Inn – remain. In total in the UK there are 23 two-star restaurants, 143 one-star and 155 Bib Gourmands – 25 of which are new this year.